World class shopping, dining, and a vibrant arts scene is what Costa Mesa is known for. Located 37 miles South of LA you can find no better place to use as your base camp for exploring Southern California than Costa Mesa. 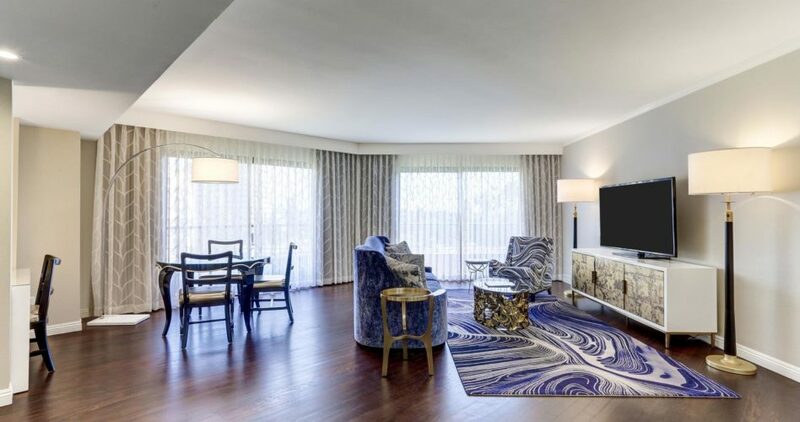 With 11 major hotels having over 2000 rooms available you should have no trouble finding the perfect place to call home during your Orange County getaway. For me, I’m staying at the Avenue Of The Arts Hotel. 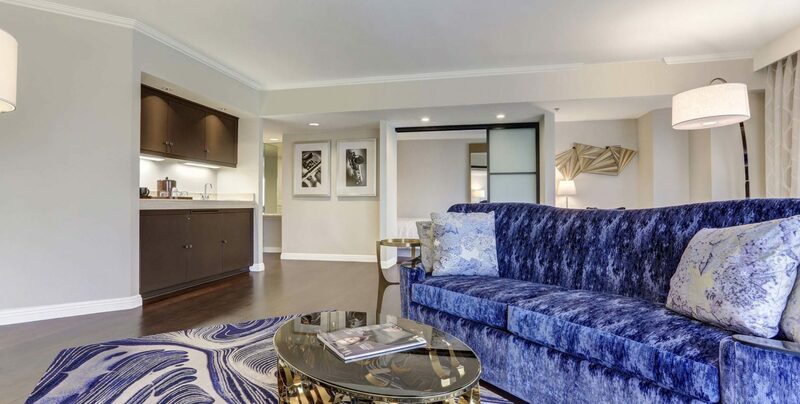 Easy walking distance to both South Coast Plaza and the Segerstrom Center for the Arts. 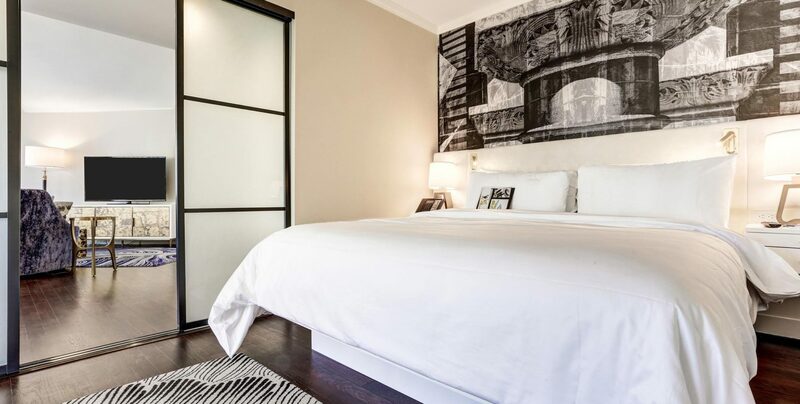 Its location is ideal and even though it is part of the Starwood Hotel group it operates as a boutique corporate hotel. You know what this means? Very few kids running up and down the hallways at night. I think I’ve picked the right Costa Mesa hotel for the right shopping adventure. When I pulled into the driveway of the Avenue of the Arts, I knew right away I had made the right choice. 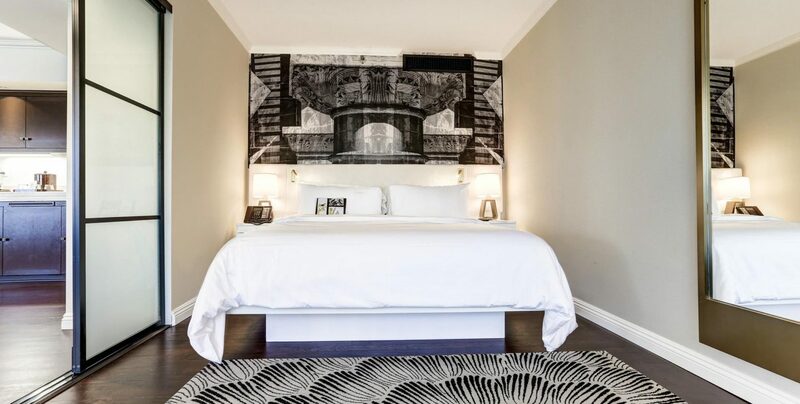 I love the convenience of hotel chains as they generally have great amenities and perks, but I love the individualised attention I get from boutique properties. 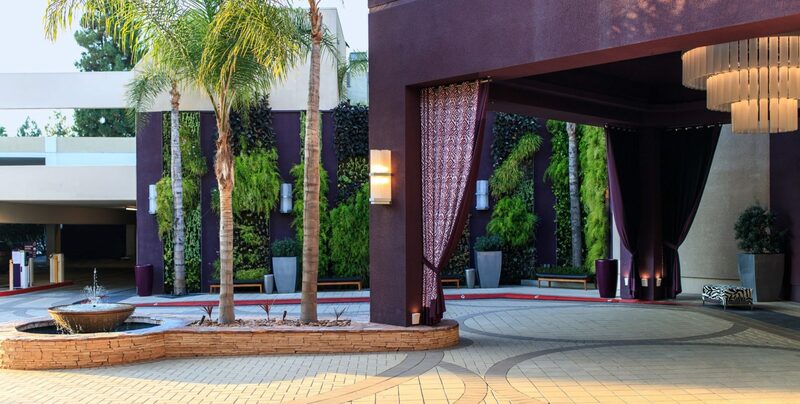 This Costa Mesa hotel blends both of these into one fantastic property. The main lobby continues the theme and decor of a boutique hotel yet the front desk staff are as efficient as any Starwood Hotel I’ve ever stayed at. 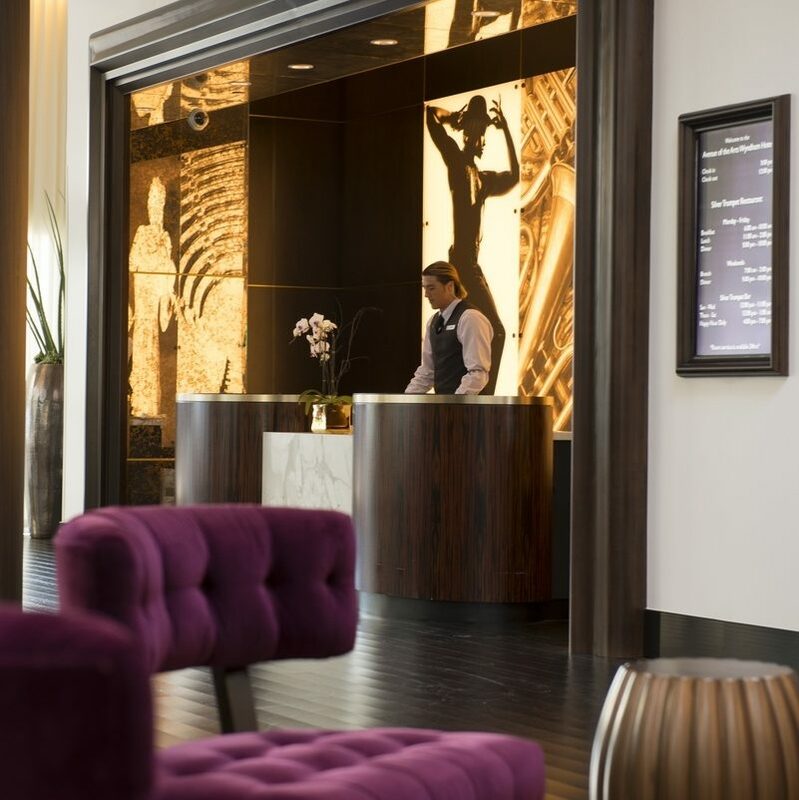 I’m a frequent guest at Starwood Hotels and so I have an SPG (Starwood Preferred Guest) card. Perhaps it was for this reason that I got bumped up to an executive suite. Whatever the reason, my next three nights are going to be relaxing in style. The first look in my room confirms this. I have a living room with dining area, a coffee bar and mini fridge, plus a work station that is comfortable and close to all the electrical plugs I need for my tech. My bedroom is separate from the living space and comes with sliding doors should I hosts guests and want some privacy. Throughout the entire property pieces of Art are on display. Not the typical paintings I’m used to at other hotels, these include more modern pieces like the large piece above my bed. 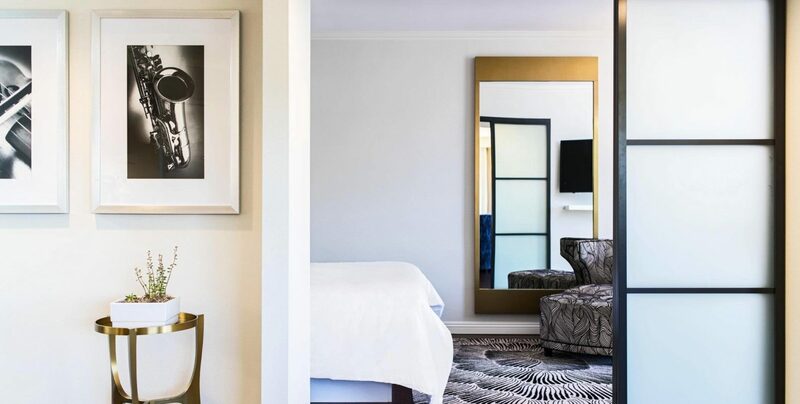 As a more corporate hotel business travellers make up a large percentage of guests Monday to Thursday, while on the weekends they are a popular wedding hotel. Either way, I wasn’t bothered by kids or by loud guests. I had my own private sanctuary in the heart of Costa Mesa.